Summary Single bay NAS powered by quad-core Realtek SoC with single Gigabit Ethernet and two USB 3.0 ports. It's been almost three years since we last reviewed a single-bay NAS - and with good reason. The market for single-bay NASes has shrunk significantly. In fact, if you shop for single-bay NASes on Amazon, many that you see are discontinued models. It's not that single-bay NASes are bad devices - they just don't provide the fault tolerance that most NAS buyers want. Single disk devices, by definition, don't have any fault tolerance. If/when the disk dies, your data is gone unless you have a backup on another device. That being said, since most NAS manufacturers use a common NAS operating system, many of the features found in more expensive multiple-bay NASes, such as file sharing, media server support, downloadable applications, personal cloud support, etc., are also found in some single-bay NASes, but at a lower price. This review will focus on Synology's single-bay DS118, which was announced last October. The DS118 isn't Synology's least expensive single bay product. That would be the DS115j, at around $120. The DS118 will be replacing the DS116 to become the entry-level offering in Synology's "Value" family. Single bay NASes typically have a Marvell processor and either 256 or 512 MB of RAM; the DS115j has a Marvell Armada 370 and 256 MB. The pricier DS118 has more processing power and RAM. In fact, the DS118's quad-core Realtek processor, 1 GB of RAM, two USB 3.0 ports and single Gigabit Ethernet port are exactly what you'll find in the recently-reviewed, top-rated, 2-bay DS218play. The chart below, generated from the NAS Finder, shows the basic differences between the DS118 and the DS218play. Other than the number of bays, the only major differences are power consumption, price and the version of firmware used for testing. Both NASes require case disassembly to install/change drives. The callout chart below shows the front and rear panel layouts for the DS118. There are three status LEDs on the front panel along with the power switch. Both of the USB 3.0 ports are on the rear panel. The legacy USB 2.0 ports found on older single-bay NASes are a thing of the past, and, as you'll see below, USB backup performance on both NASes takes advantage of the USB 3.0 ports. Setup is fairly simple, but as noted in the introduction, installation of the disk requires case disassembly to mount your disk with screws into the mounting bracket. You can download the Hardware installation guide for the details. While visiting the DS118 download center, you might want to also download the datasheet or the updated User's Guide for the DSM 6.1.5 operating system. The image below shows the main board for the DS118. This board has a large heat sink on the processor. The image below shows the main board for the DS218play. Both of the boards share the same physical dimensions and have a similar layout of components. That's not too surprising considering that both the DS118 and the DS218play have similar case sizes that vary only by the width. The boards have very similar part numbers, but the DS218play, as you might expect, has a few additional components. The table below shows the key component summary for the two Synology NASes. As noted in the introduction, the key components in the two models are the same. The DS118 drew 7 W with one of our stock WD Red 1 TB (WD10EFRX) drives spun up and 3 W in power save mode with the drive spun down. By comparison, with the same complement of installed drives, the DS218play with two drives drew slightly more power (10 W) in the active mode and 3 W in power save mode. Fan and drive noise was rated very low for both NASes. As I've noted in the recent previous Synology product reviews, all of Synology's NASes operate using DiskStation Manager 6. DSM 6.1 provides a common set of features and a consistent user interface across all of Synology's products. Of course, some higher-end products support enhanced features, such as the BTRFS filesystem that isn't supported on the Value Series products. You can also browse through the video tutorials in their Knowledge Base, or download the DSM 6.1.5 User's Guide. A more detailed description of the DSM 6.1 features can be found here. DSM 6.1.5-15254 2 firmware was loaded onto the DS118 and performance tests were run using the Revision 5 NAS test process. All tests were run using a Western Digital Red 1 TB ST1000VN001 (x1 SNB supplied). As noted earlier, most of our previously tested single bay NASes have been discontinued, so have been moved to the Charts archives. You can still view the test results by selecting Show Archived Products in the Charts, but archived products are removed from the NAS Ranker. There is currently only one other single bay (NoRAID class) NAS in the charts, but comparing against Seagate's Personal Cloud isn't a fair fight. It's not really a general purpose NAS and it's almost three years old. So to have something to compare against, I chose the DS218play. This is not an apples-to-apples comparison since the DS218play results reflect performance with two drives in RAID 0. But in reality, the performance limitation for these tests is the single Gigabit Ethernet connection between each NAS and the NAS benchmark system. I removed all of the RAID 1 test results for the DS218play from the Benchmark Summary below to make it easier to do a line-by-line comparison of the test results. Sometimes, the best surprise is no surprise at all and that's the case with the DS118 results. Both NASes had throughput well above 100 MBps for the File Copy Read and File Copy Write tests. That is the maximum that you can expect based on a single client test with a Gigabit connection. Many of the test results were within a couple of percentage points of each other with the DS118 slightly outperforming the DS218play on the USB 3.0 backup tests, the Network Backup tests and iSCSI. At around $180, the DS118 is not an inexpensive NAS. 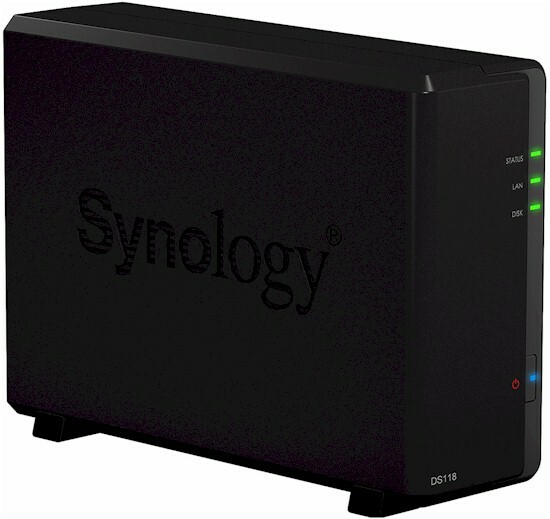 But it stands toe-to-toe with our #1 ranked two-bay NAS, Synology's DS218play. With the exception of RAID capabilities, the DS118 shares the same features as the DS218play including a hardware encryption engine, a 4K Multimedia Server that supports 10-bit H.265 online transcoding, Public Cloud Integration and low noise and power consumption. While you could save yourself $50 by purchasing the single-bay DS118 compared to purchasing the DS218play, I'd recommend against doing so. Even if you don't populate the DS218play with a second drive to add RAID1 fault tolerance now, and least you'll have the option of doing so in the future.